Fourth Row Center: Film Writings by Jason Bailey: Saturday Night at the Movies: "Clinton"
If Barak Goodman’s Clinton is an uncommonly intelligent and absorbing political bio-doc, it must be noted that he has chosen as his subject a particularly compelling figure who has had an especially dramatic political life. Goodman frames his story as one of infinite second chances, of a man whose career has been a steady series of knockdowns and rebounds, a figure who took a licking and kept on ticking. 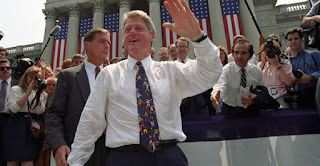 Originally airin on PBS’s American Experience and running in two parts (each just shy of two hours), Clinton begins near the end, with Clinton’s November 1998 apology in the Rose Garden for the Monica Lewinsky affair. From there, Goodman moves back to Clinton’s first big adultery scandal, when Gennifer Flowers popped up in the run-up to the New Hampshire primary. From there it goes back to Yale (with steadfast Hillary as the link), and then back to birth, creating a nice loop-the-loop construction to eschew the tired “Bill Clinton was born in…” chronology. The film is thorough, though its focus is squarely on Clinton the politician: the background material is brief, the story concluding on his exit from the White House. The early sections, detailing the formulation of his political persona, are the most fascinating (and not just for kitsch value, though the hilarious vintage campaign ad for his first congressional race certainly has that); it’s striking, in watching the young man speak during his first term as Arkansas governor, how the vocal tics and physical mannerisms are already in place (hello, pointing with the thumb). And in spotlighting Clinton the politician, Goodman focuses on his failures and bounce-backs, on the patterns that defined him. Part one is subtitled “The Comeback Kid,” part two “The Survivor,” and those are the common themes: the embarrassment of the Dukakis nominating speech (still painful to watch) and how he turned it around with a good-humored appearance on Carson; the stumbles and subsequent successes of the first term; Whitewater and Lewinsky, and the humbling and (for some) forgiveness. Clinton is not a soft-soap job—neither of the Clintons are interviewed, though many friends and colleagues (and a few enemies) are—and Goodman doesn’t finesse or apologize for the affairs, the embarrassments (Somalia, health care reform), or the failures (Rwanda, Tarnak Farms). What the film is, without question, is smart. The analysis of the first year is both penetrating and funny (“The West Wing was littered with pizza boxes and Coke cans…”); the filmmakers smartly understand how “The messiness of the process became part of the story.” The budget battle of the summer of ’93 in part one is played with the speed and intrigue of a thriller, and ditto the “gamble” of the budget-shutdown and government showdown two years later. The film poses some interesting (and still relevant) questions about the role of the First Lady, and keenly communicates what Clinton’s response to Oklahoma City meant, what it symbolized, and why it was particularly important at that moment of his presidency. And the film’s political analysis are far from purely historical; purposeful or not, the parallels to the Obama administration’s troubles are downright eerie. Even in stopping where it does, a few events of interest get glossed over. Here’s one illustrative piece of offhand narration: “Exhausted and heartsick over the recent death of his mother…” is tossed off as an aside during a section on the initial Whitewater investigation. Well, that’s kind of a big deal. But Clinton, title notwithstanding, is really more interested in the Presidency than the man—which is a shame, since the fleeting examinations of his psychology (such as the information we’re provided about his adolescence, particularly with regards to his unfaithful stepfather) are fascinating. Then again, the film argues—sometimes explicitly—that understanding Clinton the president is pretty much the same thing as understanding Clinton the man. Clinton concludes, wisely, with a discussion and acknowledgment of the former president’s flaws and contradictions, and that’s the right note to end on; it’s a fair-minded film that is neither a gloss nor a hit piece. Instead, it’s a fascinating look at a complicated political career, and a clear-eyed look at our recent but relevant history. "Clinton" is streaming on the "American Experience" website. It's is also available on DVD and Blu-ray; for full A/V and bonus feature details, read this review on DVD Talk.